Ahead of the much-anticipated film release, the Dark Knight joins the Last Son of Krypton in a new gaming app. Fans of Batman and Superman don’t need to wait until the release of their crossover movie, now that a mobile game has been released that features both characters in one of the largest battles in the history of DC Comics. Though the plot may be set on the big screen, when it comes to the game app, it’s the player who decides. The mobile game “Batman v Superman: Who Will Win?” has now been released to help to drive the excitement over the film that will be released later this month. The film is set to hit theaters on March 25, so the release of the game app is a timely one in helping people to be able to wait for the big day and to try to predict what the outcome of the actual movie will be. It provides a good amount of play time to be able to try to work out who might come out on top at the end of the motion picture. The game app is available to both iOS and Android mobile device users, as well as through browsers. The point to the game is to try to determine “Who Will Win?”, just as the name suggests. For people who don’t want to download the gaming app, this one’s also available through a regular web browser. For those who might be concerned about movie spoilers, that shouldn’t be a problem. The description of the game play is that it is direct and simple and that it plays out depending on the way the gamer heads and not necessarily in any direction that actually reflects the plot of the movie. 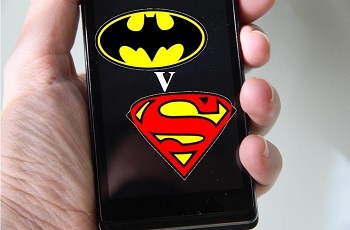 To play, the gamer needs only choose whether he or she would like to be Batman or Superman. Then, that character can make his way throughout the city while collecting items. There are also a number of potential upgrade abilities that help the character to improve performance, such as with the “head start” upgrade for running. Those can be added using points that have been accumulated throughout the game play. The points from the mobile game are also poured into a mass pool that will help to determine the way the game will end.